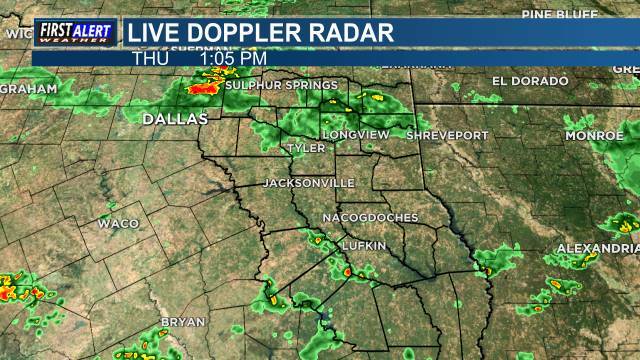 EAST TEXAS (KLTV/KTRE) - Here’s the weather where you live: Cloudy and rainy again today. Light showers will progress northward through the morning with cloudy skies and cool temperatures. This afternoon there could be some areas of drizzle but many places could see a break in the rainfall. It will still be cloudy and cool with high temperatures in the mid to upper 50s. Temperatures stay in the 50s overnight with overcast skies tomorrow and chances for rain will begin to increase again by late tomorrow evening. Likely rain again on Friday and it will once again be a cold rain. Temperatures will stay in the 50s most of the day with highs near 60 degrees by afternoon. Showers will continue into the morning Saturday but clearing skies are expected by Sunday with gradually warming temperatures into early next week.